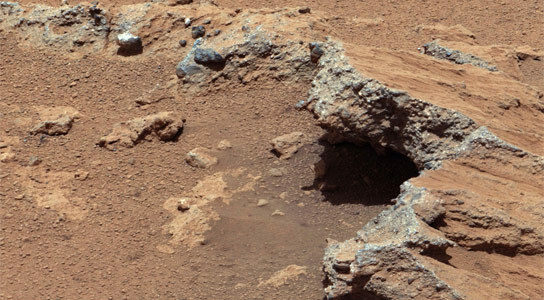 Further analysis of Curiosity data has led researchers to believe that an ancient, flowing stream once existed on Mars. Pasadena, California – Detailed analysis and review have borne out researchers’ initial interpretation of pebble-containing slabs that NASA’s Mars rover Curiosity investigated last year: They are part of an ancient streambed. 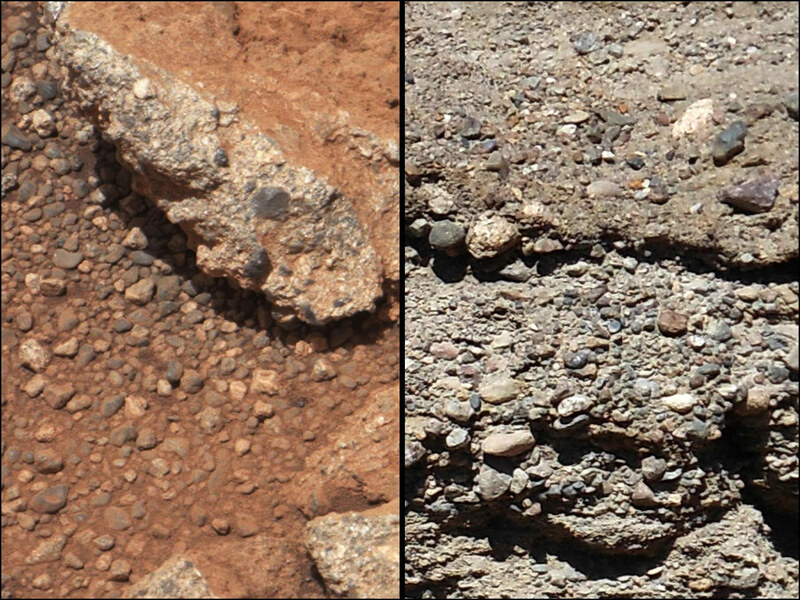 Three pavement-like rocks examined with the telephoto capability of Curiosity’s Mast Camera (Mastcam) during the rover’s first 40 days on Mars are the basis for the new report. One, “Goulburn,” is immediately adjacent to the rover’s “Bradbury Landing” touchdown site. The other two, “Link” and “Hottah,” are about 165 and 330 feet (50 and 100 meters) to the southeast. Researchers also used the rover’s laser-shooting Chemistry and Camera (ChemCam) instrument to investigate the Link rock. The atmosphere of modern Mars is too thin to make a sustained stream flow of water possible, though the planet holds large quantities of water ice. Several types of evidence have indicated that ancient Mars had diverse environments with liquid water. 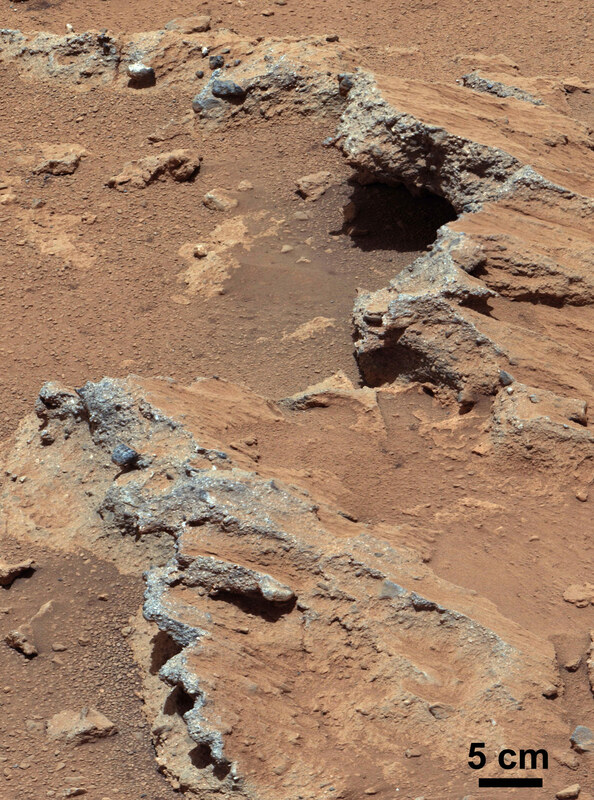 However, none but these rocks found by Curiosity could provide the type of stream flow information published this week. Curiosity’s images of conglomerate rocks indicate that atmospheric conditions at Gale Crater once enabled the flow of liquid water on the Martian surface. During a two-year prime mission, researchers are using Curiosity’s 10 science instruments to assess the environmental history in Gale Crater on Mars, where the rover has found evidence of ancient environmental conditions favorable for microbial life. More information about Curiosity is online at: http://www.jpl.nasa.gov/msl , http://www.nasa.gov/msl and http://mars.jpl.nasa.gov/msl/. 2 Comments on "Curiosity Finds Evidence of Ancient Streambed on Mars"
The streambeds of Mars are well preserved to tell the story with pebbles. Water is universal for all planets, including Moon and it has extra planetary origin in cosmos from the enveloping gases irradiated. Comets are a proof for that since they are mountains of ice and rocks. Thank You. Hi, Madaganopal.V.C!I hope you don’t mind me suggesting it but your statement appears to me to be somewhat erroneous! Although ‘Water’ may be ‘Universal’ I think you would have a hard time finding ‘Water’ anywhere on, Venus or Mercury, or in fact any other such planets too close to their, Sun! As for Comets, they could have been created in a number of ways I.E. Exploding planets, left overs from the, ‘Bang’, etc..
As a further issue, I think that what those involved in providing this kind of information are trying to do is, convince us that there may be ‘Life’ on, Mars. The latter predisposition based on the concept ‘Water = Life’… Take it from, Me; It doesn’t… One could have an entire planet or Moon covered in water and it could still be completely devoid of, ‘Life’. Life was created on Earth due to a number of very specific circumstances. I know because I studied the subjects involved very comprehensively indeed and you can take it from me that, ‘Curiosity Rover’ will NEVER discover, any kind of life-form on Mars, no matter where it looks.